The loudnessMeter System object™ computes the loudness, loudness range, and true-peak of an audio signal in accordance with EBU R 128 and ITU-R BS.1770-4 standards. Create the loudnessMeter object and set its properties. 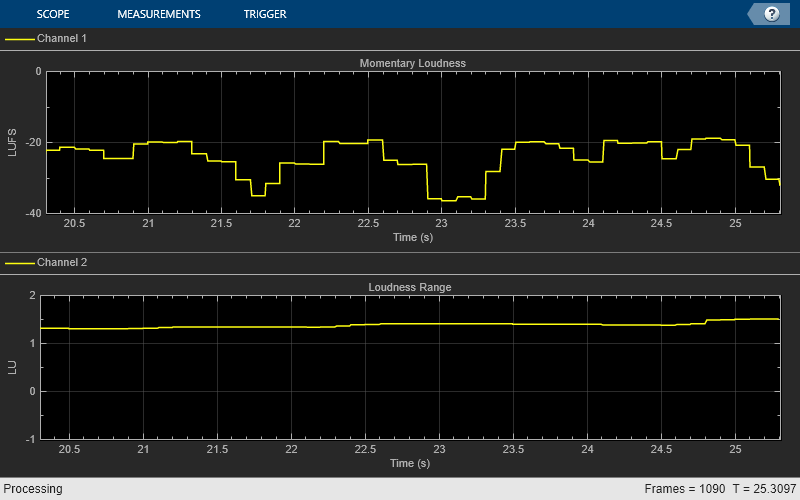 loudMtr = loudnessMeter creates a System object, loudMtr, that performs loudness metering independently across each input channel. loudMtr = loudnessMeter(Name,Value) sets each property Name to the specified Value. Unspecified properties have default values. 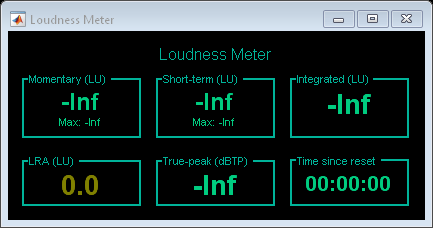 Example: loudMtr = loudnessMeter('ChannelWeights',[1.2, 0.8],'SampleRate',12000) creates a System object, loudMtr, with channel weights of 1.2 and 0.8, and a sample rate of 12 kHz. Linear weighting applied to each input channel, specified as a row vector of nonnegative values. The number of elements in the row vector must be equal to or greater than the number of input channels. Excess values in the vector are ignored. The default channel weights follow the ITU-R BS.1170-4 standard. To use the default channel weights, specify the input signal channels as a matrix in this order: [Left, Right, Center, Left surround, Right surround]. As a best practice, specify the ChannelWeights property in order: [Left, Right, Center, Left surround, Right surround]. Use relative scale for loudness measurements, specified as a logical scalar. false –– The loudness measurements are absolute and returned in loudness units full scale (LUFS). true –– The loudness measurements are relative to the TargetLoudness value and returned in loudness units (LU). Target loudness level for relative scale in LUFS, specified as a real scalar. For example, if the TargetLoudness is –23 LUFS, then a loudness value of –23 LUFS is reported as 0 LU. To enable this property, set UseRelativeScale to true. [momentary,shortTerm,integrated,range,peak] = loudMtr(audioIn) returns measurement values for momentary and short-term loudness of the input to your loudness meter, and the true-peak value of the current input frame, audioIn. It also returns the integrated loudness and loudness range of the input to your loudness meter since the last time reset was called. Audio input to the loudness meter, specified as a matrix. The columns of the matrix are treated as independent audio channels. If you use the default ChannelWeights of the loudnessMeter, as a best practice, specify the input channels in this order: [Left, Right, Center, Left surround, Right surround]. Momentary loudness in loudness units relative to full scale (LUFS), returned as a column vector with the same number of rows as audioIn. By default, loudness measurements are returned in LUFS. If you set the UseRelativeScale property to true, loudness measurements are returned in loudness units (LU). Short-term loudness in loudness units relative to full scale (LUFS), returned as a column vector with the same number of rows as audioIn. Integrated loudness in loudness units relative to full scale (LUFS), returned as a column vector with the same number of rows as audioIn. Loudness range in loudness units (LU), returned as a column vector with the same number of rows as audioIn. True-peak loudness in dB-TP, returned as a column vector with the same number of rows as audioIn. Create a dsp.AudioFileReader System object™ to read in an audio file. Create a loudnesMeter System object. Use the sample rate of the audio file as the sample rate of the loudnessMeter. Read in the audio file in an audio stream loop. Use the loudness meter to determine the momentary, short-term, and integrated loudness of the audio signal. Cache the loudness measurements for analysis. Plot the momentary, short-term, and integrated loudness of the audio signal. Create an audio file reader and an audio device writer. Create a time scope to visualize your audio stream loop. Create a loudness meter. Use the sample rate of your input file as the sample rate of your loudness meter. Call visualize to open an 'EBU-mode' visualization for your loudness meter. Read in your audio file. Compute the momentary loudness and loudness range. 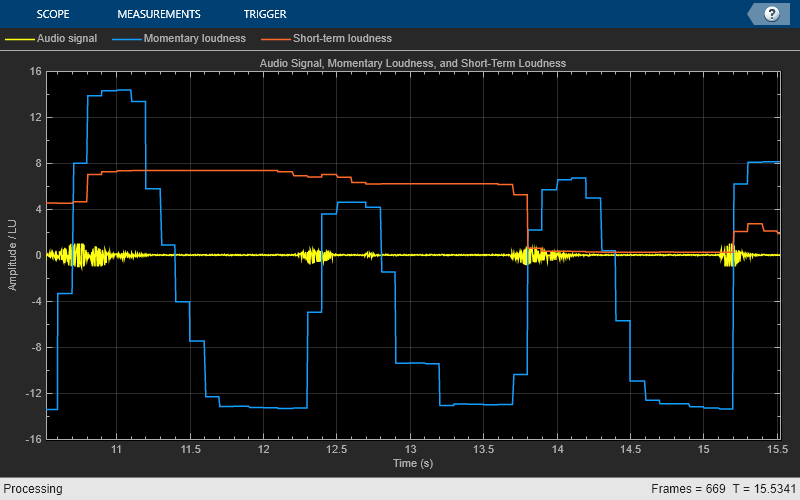 Visualize the momentary loudness and loudness range on your time scope. The 'EBU-mode' loudness meter visualization updates automatically while it is open. As a best practice, release your file reader and device writer once the loop is completed. Create an audio file reader to read in an audio file. Create an audio device writer to write the audio file to your audio device. Use the sample rate of your file reader as the sample rate of your device writer. Create a loudness meter with the target loudness set to the default -23 LUFS. Open the 'EBU-mode' loudness meter visualization. Create a time scope to visualize your audio signal and its measured relative momentary and short-term loudness. In an audio stream loop, listen to and visualize the audio signal. The loudnessMeter System object calculates the momentary loudness, short-term loudness, integrated loudness, loudness range (LRA), and true-peak value of an audio signal. You can specify any number of channels and nondefault channel weights used for loudness measurements. The loudnessMeter algorithm is described for the general case of n channels with default channel weights. The input channels, x, pass through a K-weighted weightingFilter. The K-weighted filter shapes the frequency spectrum to reflect perceived loudness. mPi is the momentary power of the ith segment. w is the segment length in samples. Gc is the weighting for channel c.
mL is the momentary loudness returned by your loudnessMeter System object. It is also used internally to calculate the integrated loudness (steps 3–6). The integrated loudness measurement considers the audio signal since the last reset of your loudness meter. 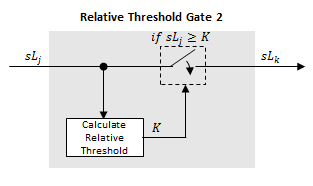 To calculate integrated loudness, the momentary power is passed through a gating system. The gate system pauses the measurement during periods of low sound, such as stretches of silence in a movie. mPj is cached until your loudnessMeter is reset. 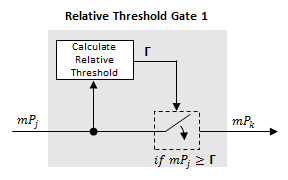 The momentary power subset, mPj, passes through a relative threshold gate. The relative threshold is recomputed during each call to your loudnessMeter object. The cached values of mPj are gated again depending on the updated value of Γ.
sPi is the short-term power of the ith segment of a channel. sL is the short-term loudness returned by your loudnessMeter System object. It is also used internally to calculate the loudness range (steps 3–5). sLj is cached until your loudnessMeter is reset. The short-term loudness subset, sLj passes through a relative threshold gate. The relative threshold, K, is recomputed during each call to your loudnessMeter object. The cached values of sLj are gated again depending on the updated value of K.
The short-term loudness subset, sLk, is sorted. The loudness range is calculated as between the 10th and 95th percentiles of the distribution and is returned in loudness units (LU). The true-peak measurement considers only the current input frame of a call to your loudness meter. The signal is oversampled to at least 192 kHz. To optimize processing, the input sample rate determines the exact oversampling. An input sample rate below 750 Hz is not considered. The oversampled signal, a, passes through a lowpass filter with a half-polyphase length of 12 and stopband attenuation of 80 dB. The filter design uses designMultirateFIR. The true-peak is determined as the maximum of the converted signal, c.
 International Telecommunication Union; Radiocommunication Sector. Algorithms to Measure Audio Programme Loudness and True-Peak Audio Level. ITU-R BS.1770-4. 2015. European Broadcasting Union. Loudness Normalisation and Permitted Maximum Level of Audio Signals. EBU R 128. 2014. European Broadcasting Union. Loudness Metering: 'EBU Mode' Metering to Supplement EBU R 128 Loudness Normalization. EBU R 128 Tech 3341. 2014. European Broadcasting Union. Loudness Range: A Measure to Supplement EBU R 128 Loudness Normalization. EBU R 128 Tech 3342. 2016. Dynamic Memory Allocation must not be turned off.